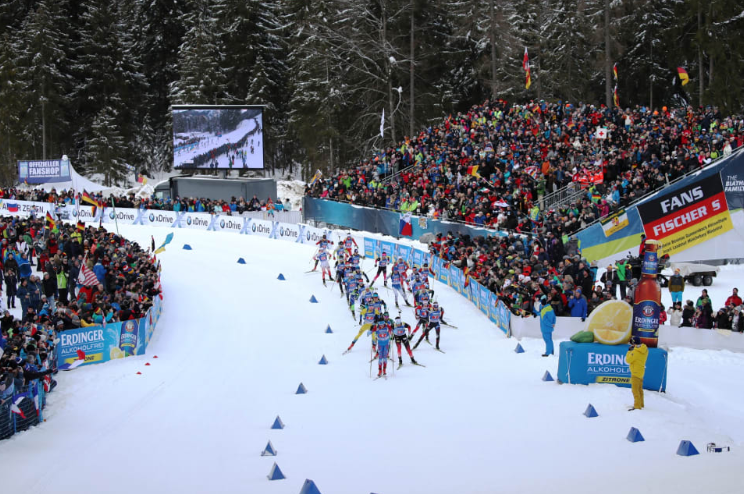 In relatively calm weather on Friday in Ruhpolding, Germany the International Biathlon Union (IBU) World Cup sent the men’s 4 x 7.5-kilometer relay on its way. Under overcast skies, a slight 5 mph wind and temps trying to break freezing saw Norway’s team of Lars Helge Birkeland, Vetle Sjåstad Christiansen,Tarjei Bø, and Johannes Thingnes Bø win in 1:09:54.3 hours. The Norwegian foursome raced to the top podium spot with no penalties and using eight spares. Germany’s Rees Roman, Johannes Kuehn, Arnd Peiffer, and Doll Benedikt placed second 13.5 seconds behind Norway. Rees shot clean for Germany as did Peiffer – in total the German team shot with no penalties and used six spares. The final podium spot went to France’s Emilien Jacquelin, Martin Fourcade, Quentin Fillon Maillet, and Simon Desthieux. France finished 26.2 seconds back while skiing no penalties and using nine spares. Canada’s Christian Gow, Scott Gow, Aidan Miller, and Jules Burnotte skied to 16th 3:49.0 minutes behind Norway. In total, the Canadians skied one penalty and used 16 spares. The U.S. team of Leif Nordgren, Sean Doherty, Jake Brown, and Max Durtschi raced to 17th, stopping the clock 4:01.2 after Norway. Over the duration of their four legs, the U.S. skied a single penalty lap while using 13 spares. Twenty seven teams were entered in the men’s race. The Canadian selection races for senior World Championships combined with a NorAm and Québec Cup weekend hosted by the Mont Orford club, began with freestyle sprints today. On the men’s side, Evan Palmer-Charrette (Team R.A.D.) won the A final in 3:06.58 minutes, 0.11 seconds ahead of Julien Locke (CNST). Top qualifier Russell Kennedy (Team R.A.D.) was third, 2.26 behind Palmer-Charrette and 0.24 seconds ahead of Sebastien Boehmler-Dandurand (AWCA). Antoine Briand (Skibec) finished sixth (+5.12), followed by Dominique Moncion-Groulx (Nakkertok) in sixth (+5.93). Racing continues for two more days with an interval start classic on Saturday and mass start skate on Sunday. The top Canadian each day qualifies for World Championships.